It’s been a bit of a strawberry fest over the last couple of weeks, it has been a really prolific harvest this year and we haven’t been able to keep up with eating them fresh. So far I have made Strawberry and Lavender sorbet (very good), Strawberry Fromage Blanc Ice Cream (lovely), Strawberry and Rhubarb with Meringue Topping (delish), gently cooked alongside Spiced Pineapple and we’ve eaten them plain with and without cream, as Eton Mess – mixed with meringues and vanilla ice cream – and as a savoury dish, combined with avocado in a salad (very complementary). So I decided to try drying some in the oven. I made a coulis. I cooked some gently as a compote. 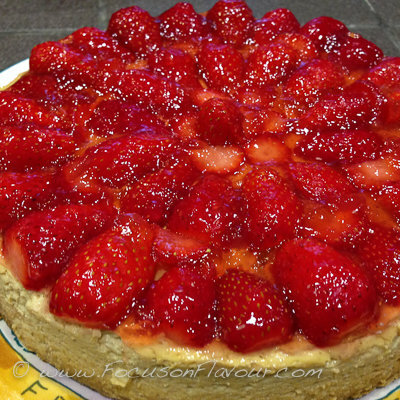 Then I made my low calorie, greek yogurt based, New York style cheesecake with lemon and topped it with fresh strawberries. This makes a great treat for the weekend, but doesn’t leave you feeling over-stuffed. Of course with just the two of us we didn’t want to waste it, so we had a tiny sliver each for dessert on our fast day too…. Using oats instead of digestive biscuits (Graham crackers) for the crust and delicious Greek yogurt instead of cream cheese for the filling, makes this a much lighter but still delicious alternative to a classic New York Cheesecake. Preheat oven to 140°C (fan). Mix oatcake crumbs and melted butter, then turn out into a 20cm (8-inch) loose-bottomed cake tin pan and press mixture into an even crust across the bottom, with the back of a spoon. Bake for 10-15 minutes until firm and dry, then remove from oven and put on a wire rack. In a large bowl, beat eggs and egg yolks on low speed, then add sugar, cornflour, salt, vanilla, and yogurt and continue to beat on low speed until light and slightly bubbly. Add lemon juice and lemon zest and beat briefly to incorporate. Pour mixture into prepared crust and place in the centre of the oven. 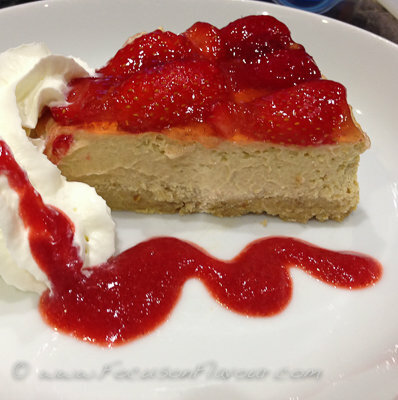 Start checking cheesecake after 50 minutes and then every 5-10 minutes after that, by shaking the pan gently – the filling should look creamy but firm at the edges, and still appear slightly jiggly in the centre (it will firm up as it cools). Remove from oven and set on a wire rack to cool to room temperature. Refrigerate for at least 4 hours (or overnight) before serving. I didn’t calculate the calories for the strawberry topping, I would guess no more than 20 calories per serving, including the ‘nappage’ (can’t think what that’s called in English!). Perfect to top a simple dessert of fromage blanc or Greek yogurt, to drizzle over ice cream or to top a cheesecake. Wash the strawberries and put in a small plan with the sugar and vinegar. Cook gently for about 5 minutes until soft enough to pass through a sieve. These recipes are taken from my book “5:2 Healthy Eating for Life” which is available on Amazon in print and kindle formats. This is what we had for lunch today – totally delicious and lovely textures. 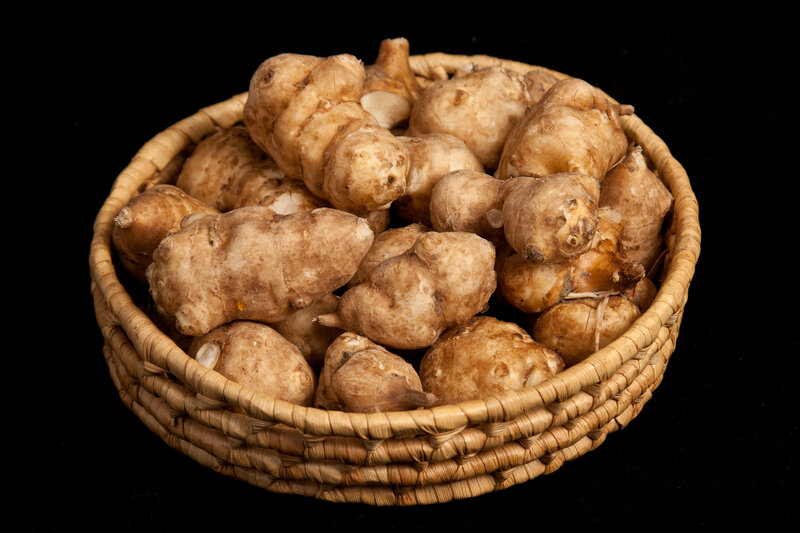 This makes a great feature of Jerusalem Artichokes, which are in season now. Not entirely plant-based proteins, because of the goat’s cheese…. Slice the artichokes into rounds, about 5mm (1/4″) thick. Cook in boiling lightly salted water for about 3 minutes, until slightly soft. Drain. 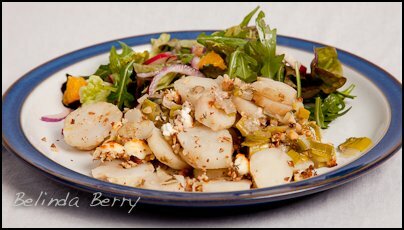 Toast the walnuts in a dry frying pan until slightly coloured, then chop finely. Trim, wash and slice the leeks finely. Heat the oil in a saucepan, add the leeks and spices, stir fry for a minute or two, then add about 100ml of water. Put the lid on and lower the heat to minimum and cook for about 10 minutes until soft and luscious. Put the leeks in the bottom of an ovenproof dish. If they have dried out, add a couple of tablespoons of water, then layer the artichokes on top. Sprinkle the nuts over and then crumble the goats cheese on top. Sprinkle with fresh thyme leaves. Bake in the oven for 20 – 25 minutes, until the cheese is starting to brown. 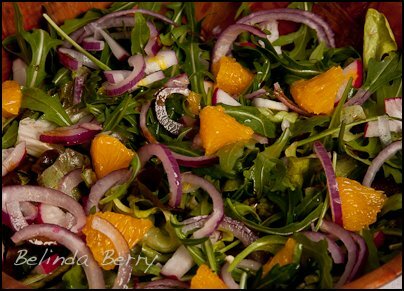 Serve with a rocket and orange salad (half an orange), dressed with the squeezed orange juice and a few drops of aged balsamic vinegar. 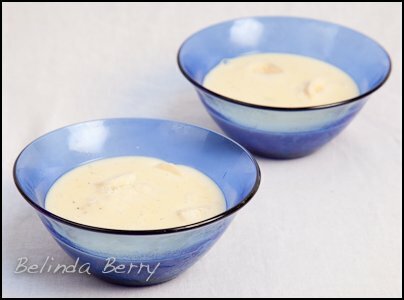 We finished our meal with Vanilla Soya Custard with Banana. I’m finding that portion sizes of recipes are usually way too large and there seems to be a complete obsession with adding sweetness to things in recipes, even on the BBC Good Food Healthy recipes section. Case in point: yesterday I cooked braised red cabbage. The recipe called for a tablespoon of brown sugar! It didn’t need it, a drop of aged balsamic brought out the sweetness. I made a parsnip dish, the recipe called for a tablespoon of honey! Parsnips are naturally sweet, they don’t need any extra! I made a pear dessert, the recipe called for a tablespoon of honey per person! Again, pears already have natural sugars, but I did add a teaspoonful between us. No wonder so many people are struggling with their weight! If I had followed the recipes without thinking, we each would have consumed 1/2 a tablespoon of sugar and a tablespoonful of honey. I don’t think the food would have tasted any better for it. If you can stop having sweeteners in drinks like tea and coffee, then it becomes possible to appreciate the innate sweetness of fruits and vegetables and then the amount of sugar that you need everywhere else in your diet can be dramatically reduced. Sweet nothings…. Black coffee, herb tea, mineral water, lemon and ginger tea, rooibosh tea – that’s what I’m looking forward to today. Try and leave out the artificial sweeteners altogether, they don’t do your body any favours. Sugar-free does not mean impact-free, your body can still respond as if it was having sugar. Leave the diet coke on the shelf. Try and make fast day a day of sweet nothings. All photographs © Belinda Berry or © Graham Berry. All rights reserved.